Canine Companions assistance dogs are provided free of charge thanks to your donations. We only have three days to reach our goal of $75,000. 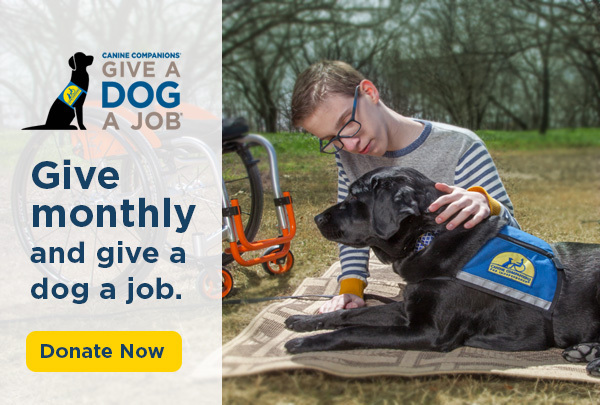 Help us Make Every Day Independence Day - and Give a Dog a Job. Eukanuba has partnered with Canine Companions to create a video to tell the story of a Canine Companions puppy that grows up to graduate as a service dog. Thank you to Eukanuba for creating this wonderful video. Please visit cci.org/corporatepartners. Canine Companions dog Kinkeade recently started professional training at the South Central Training Center. He’ll work with a professional trainer to learn over 40 commands. Follow Kinkeade's blog to see if he has what it takes to become an assistance dog! Jam City and Peanuts Worldwide has launched Snoopy Pop, a bubble shooter game starring characters from the comic by Charles M. Schulz. Jam City will also make a $100,000 contribution to Canine Companions. Click here to learn more and download the game. Change a life, four paws at a time. Register for DogFest today! Nominate your assistance dog for AKC's Award of Canine Excellence. Read more success stories on our website. Check out a time-lapse video of the new, all-inclusive playground at the Southeast Training Center. Get a free tote with online gift shop purchase of $45 or more until July 31. Use checkout code 1123 for blue and 1124 for yellow.